“Destination: Titan” is a 2016 BBC TV film (58 minutes), giving a chronicle of the work of a team of British scientists at Kent University from about 1990 all the way to the time of the Cassini launch, journey to Saturn, and release of the Huygens spacecraft to the surface. The film spans so much time that you can see the aging of the scientists. The suspenseful conclusion of the film, following a mathematical adjustment for synching meaning Huygens is released later, shows the best images of Titan’s surface, ever seen in media. This ought to be reworked for an Imax movie. It rather looks like a California desert through orange smog. 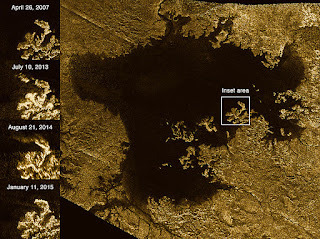 Wikipedia attribution link for NASA Titan surface images, p.d. "How Would We Respond to an Alien Invasion?"